The main influx of visitors to the Algarve arrive in summer, driven either out of necessity dictated by the school holidays, or a blind craving for the warmth and sunlight of which so many are deprived in their home countries. Our region guarantees the warmth and sun, but visitors in July and August, greeted by the parched and brown landscape, could be forgiven for believing that the Algarve countryside is totally bereft of wildlife and flowering plants. There is, however, still an abundance of opportunities to go out and enjoy the countryside and to find some of the birds and other animals for which the Algarve is famous. The key is to do what the wildlife does in hot, dry weather....head for water, and do it early or late thus avoiding the withering heat of the middle of the day. 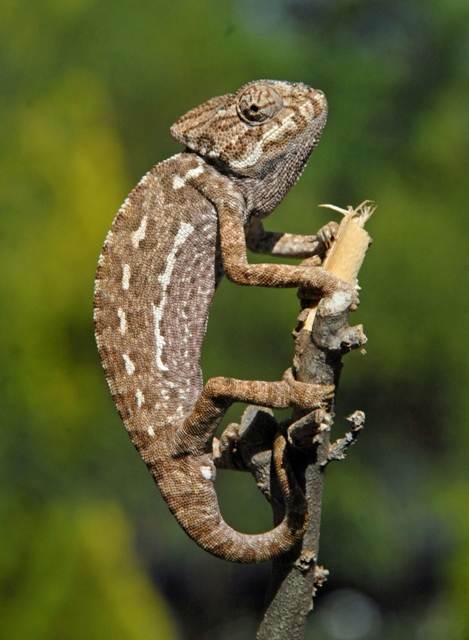 The Algarve is one of the few remaining strongholds of a fabulous creature - the European Chameleon, also known as the Mediterranean Chameleon. 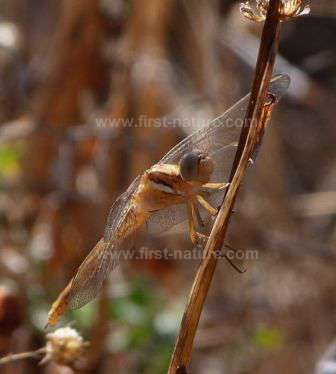 Famed for its ability to change colour, this master of disguise is probably far more numerous in the Algarve than many of us would believe. Chameleons spend most of the time in bushes and are remarkably hard to spot but, in September, following mating, the females descend to the ground in order to lay their eggs. This is the best time to go looking for them. Having hidden from us so effectively most of the year, their behaviour suddenly seems almost cavalier and they can often be spotted casually strolling around - even crossing busy roads in search of a suitable site to deposit the next generation. 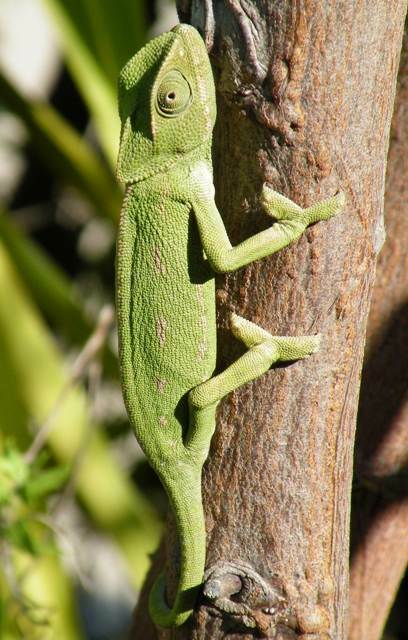 The two top places to see the Chameleon are the Ria Formosa Nature Reserve...and the San Antonio Forest.... The centre at Ria Formosa is open, but the one at San Antonio has been closed for a considerable time. It is still possible to enjoy good walks in the latter, however. Aromatic Inula is in flower for much of the summer and into autumn - in some areas which are particularly parched, its bright flowers provide a bit of variety although this can never be described as a 'pretty' shrub! Sea Squill plants are visible for most of the year. Early on the bright green leaves sprouting from a large bulb, which is often above ground, are very obvious. Later the showy spikes break up the brown fields. Also seen in the summer are clumps of Mediterranean Mezereon (also called Daphne) Daphne gnidium, sporting both flowers and berries on the same panicle. 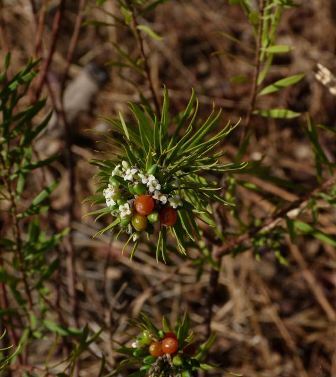 This plant is highly toxic and in Portuguese is called Mata-lobos (wolf killer) and even today the berries are illegally used to poison the last of the fish in the river pools. 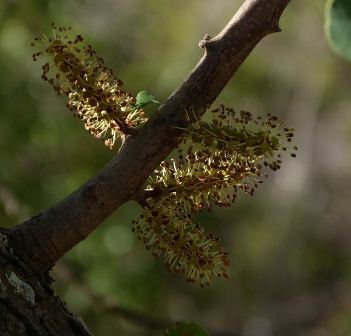 Most Algarve trees are deep-rooted and the Carob is no exception. Its discreet flowers are hidden on trunks, but in late summer and auturm their pungent scent fills the air and reveals their presence. Some liken the smell to fresh toast or mushrooms whilst others think more of sweaty socks. Carob seeds are made into chocolate which is particularly suitable for those suffering from diabetis and who cannot consume sugar. Delicious carob tarts are available in many bakers in the area. 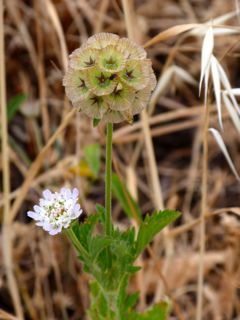 Above: Scabiosa stellata is one of the later-flowering wildflowers of the Algarve and is a magnet for insects, especially butterflies. Picture Clive Viney. One tough plant that can survive everything that high summer can throw at it is the Spanish Oyster Plant Scolymus hispanicus, and to prove the point it grows in some truly inhospitable spots too. 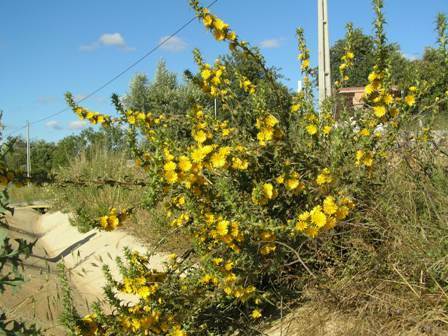 It’s very hard to miss and often grows up to two metres in height, with long straggly stems bearing bright yellow flowers and vibrant green leaves, in sharp contrast to most other plants around that by now have become scorched and brown. 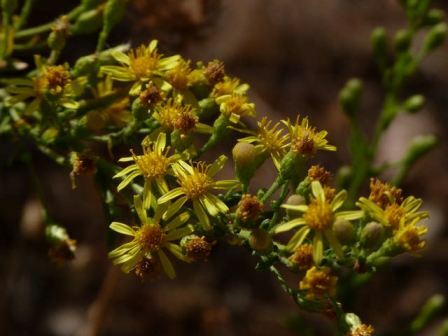 This member of the Daisy family differs from its benign relatives such as the Crown Daisies which are so common in the Algarve; it has very sharp spines and should be admired from a safe distance. 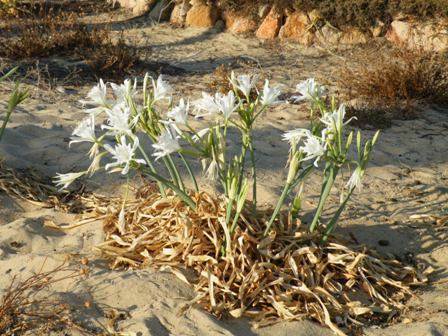 Another common high summer beauty which seems to be indestructible is the Sea Daffodil Pancratium maritimum. Growing in perhaps the toughest environment the region has to offer, this glorious flower thrives on salty beaches despite the high footfall of visitors in summer and the cold windy conditions in winter when only its dark strap-like leaves and a scattering of large black seeds are visible. 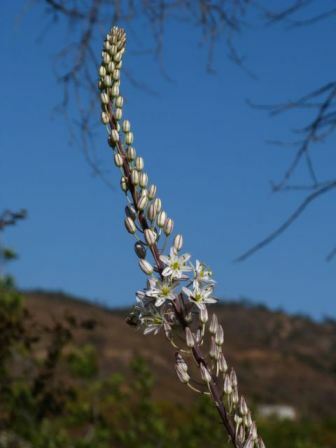 The plant emerges from a deeply buried bulb, and the showy pure white flowers grow in clusters of 3 to 15. Blooming from July onwards, Sea daffodil delights summer visitors who, never having witnessed our spring flower bonanza, might otherwise imagine the Algarve to be a flower-free zone. When the Algarve is parched birdwatchers should do what the birds do - look for water! Ray Tipper spots birds in the heat. Towards the end of a long, hot summer the Algarve countryside lies parched. What grass remains, long ago turned buffy-brown. Streams are completely dry, only their rock-strewn beds defining where water once flowed. At this time of year any lying water acts like a magnet to birds and bird photographers. This morning I sat in front of a small pool that owed its existence to a leaking water main for a classic session of 'wait-and-see' photography. Although the range of species was small, light conditions were excellent so this was an opportunity to enlarge a portfolio of stock images. Over the course of three hours, just five species came to the pool yet there was something there for the majority of the time. 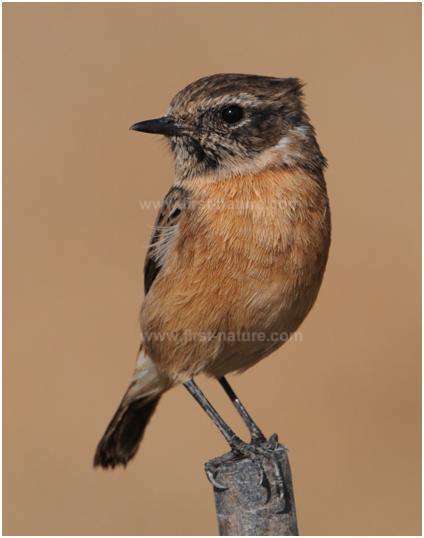 Members of a family of Common Stonechats were constantly visiting and young Crested Larks ran down the slope, warily, to drink. 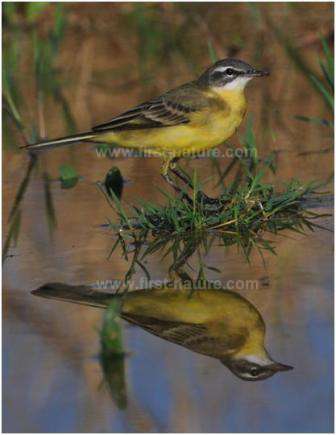 Several Yellow Wagtails of the Iberian race iberiae found the pool very much to their liking and there were brief visits by a young Little Ringed Plover and Common Sandpiper. Just once a Southern Grey Shrike perched on a nearby small conifer and was considerate enough not to hide behind too much foliage. With not even a hint of a breeze, it was hot in my car, which I was using as a photographic hide, but that was a small inconvenience on a fascinating morning. Until the leak is repaired, I shall regularly return to the pool to 'wait-and-see'. Perhaps, on another day the Western Marsh Harrier that patrolled in the distance will pass much closer or, as it is now prime migration time, something more unusual will drop in. The pool looks ideal for a Temminck's Stint! September migration at Sagres - Ray Tipper reports on what to look out for as the autumn migration gets underway. 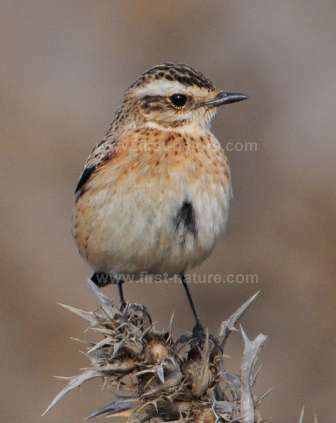 Above: Migrant Whinchat Saxicola rubetra Sagres. 12th September - Sagres (with Cape St. Vincent) is justly famed as an autumn migration watch point as might be expected of its location at the most south-westerly point of continental Europe. Today there was a strong wind blowing from a southerly quarter producing conditions that were likely to deter migrants from setting out on a sea crossing to North Africa. This was not the only reason for being in Sagres, though. 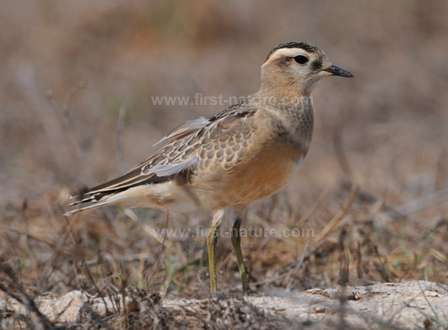 Over the past several days a trip of Dotterels had grown from two to five individuals; bound for the stony steppes of central Morocco they had paused their migration to 're-fuel' at the species' only regular site in the Algarve. Annual numbers are tiny so it is a bird prized not only for its stunning beauty but also for its scarcity. So, in a mood of excited expectancy we drove away from Tavira well before dawn to be at Sagres as the light grew bright enough for photography. For three hours we searched every patch of short grassland we could find, seeing nine Little Bustards in the process but no Dotterels. Anticipation turned to disappointment - the Dotterels had clearly left overnight for North Africa. There was nothing for it but to concede defeat and switch our attention to raptors, a light passage of which was evident from the most famous watch site, the trig point on the rise at Cabranosa. Here, there were sporadic passages of Honey Buzzards to watch along with ones and twos of Short-toed Eagle, Montagu’s Harrier, Northern Goshawk, Osprey and Peregrine Falcon. The many Common Kestrels were probably a mixture of resident birds and migrants. Juvenile Dotterel Charadrius molinellus Sagres, September. Elsewhere, migrant passerines were much in evidence. Most numerous were Yellow Wagtails that were busy feeding on the sward but were flighty in the windy conditions and difficult to approach. With a little patience, though, it was possible to scrutinize the groups and determine that there were at least four races present – nominate flava, iberiae, a single adult male thunbergi and the British breeding flavissima. Tawny Pipits, too, were moving through and there were good numbers of Northern Wheatears, Willow Warblers, Common Chiffchaffs, Spotted Flycatchers, juvenile Woodchat Shrikes as well as a few Whinchats. In the early afternoon, more in desperation than hope, we returned to Vale Santo to look once again for Dotterels. More searching revealed nothing until we finally accepted failure and were driving away when, to our utter astonishment, one stood up and showed itself. Later we found two more hunkered down against the wind where they were virtually invisible. Our joy was palpable and deservedly so because, in the end, we enjoyed stunning views of one of Europe’s most handsome waders. Clive Viney is co-author of Algarve Wildlife - the natural year.